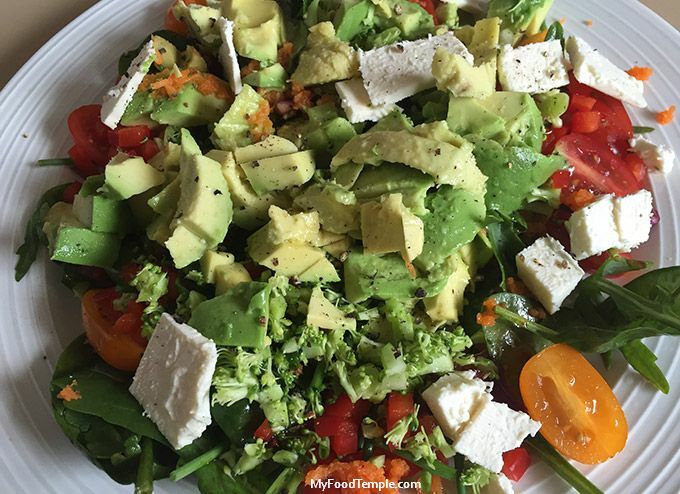 If there is such a thing as the pot of gold at the end of the rainbow, this Avocado Feta and Vegetable Salad is it. It is loaded with some of the best. most colourful and tastiest healthiest foods in life – avocado, carrot, broccoli, capsicum, spinach, rocket, onion, tomatoes. The only way you can wrong, is not to make it – yum. Each mouthful feels almost sinful its so good. Perfect eaten as a main meal and works as a decadent delicious side dish too. I created this when trying to pack a meal with nutrients for lunch. I expected it to taste good, but it tasted amazing. Serves 1 as a main meal or 2-4 as a side dish.